Vandalism is part of every city and unfortunately this motorbike was the unlucky victim in the city of Marseille in Provence, France. 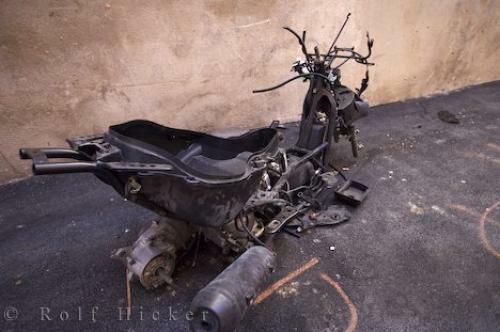 Photo of a motorbike that was part of some of the vandalism in the city of Marseille in Provence, France. ... Wherever you travel or even in at your own house, you should be protected the best that you can so that vandalism such as this can somehow be avoided.The easier that one lets themselves be the target of vandalism, the more likely it will happen to them. While traveling to big cities, be sure you find out the areas that you should not be around and keep to the better parts of each destination that you stop at.Vandalized Motorbike in downtown Marseille, Bouches du Rhone, Cote Bleue, Blue Coast, Mediterranean, Provence, France, Europe. I photographed this photo with the digital SLR camera model Canon EOS-1Ds Mark II, aperture of f/2.8, exposure time of 1/40 sec. on ISO 100, as always I used a original Canon Lens, the focus lenght for this picture was 21mm.